It's a wolf-hunting strategy action RPG. 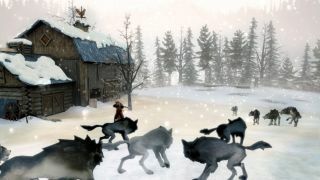 Way back in 2012, when the UK had the Olympics and shaky Nostradamus predictions were all the rage, Omri Petitte told you all about Sang-Froid - Tales of Werewolves, a genre-mingling, tower-defencey strategy game that sees you defending your homestead from packs of nasty wolves. It came out, to some critical acclaim I seem to recall, and that was that. Or was that that? No, turns out it wasn't, for Sang-Froid has just ditched its price tag and gone free on Steam. That Steam page invites us to "see below for more info", but as no info presents itself, I can only assume it's a gesture of goodwill in these troubled times. If you're wondering what Sang-Froid is all about, have a watch of the following trailer from a few years ago. After wrapping up development on the game, creator Artifice Studio went on to make Conflicks - Revolutionary Space Battles, a game where spaceships, lasers and chickens somewhat improbably collide.